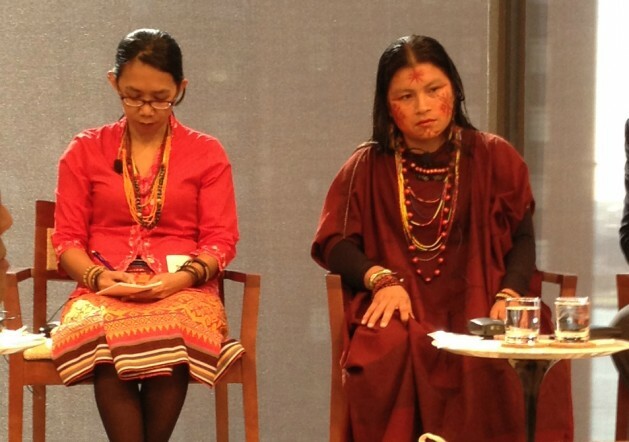 Indigenous Asheninka activist Diana Rios (centre) from the Amazon village of Saweto, Peru is the daughter of slain activist Jorge Rios who was murdered by illegal loggers in September 2014. Credit: Lyndal Rowlands / IPS. NEW YORK, Jun 22 2016 (IPS) - 2015 was the deadliest year on record for the killings of environmental activists around the world, according to a new Global Witness report. The report, On Dangerous Ground, found that in 2015, 185 people were killed defending the environment across 16 countries, a 59 percent increase from 2014. “The environment is becoming a new battleground for human rights,” Global Witness’ Campaign Leader for Environmental and Land Defenders Billy Kyte told IPS. “Many of these activists are being treated as enemies of the state when they should be treated as heroes,” he continued. The rise in attacks is partially due to the increased demand for natural resources which have sparked conflicts between residents in remote, resource-rich areas and industries such as mining, logging and agribusinesses. “The murders that are going unpunished in remote mining villages or deep within rainforests are fuelled by the choices consumers are making on the other side of the world." -- Billy Kyte. Among the most dangerous regions for environmental activists is Latin America, where over 60 percent of killings in 2015 occurred. In Brazil, 50 environmental defenders were killed, the world’s highest death toll. A majority of the murders in Brazil took place in the biodiverse Amazon states where the encroachment of ranches, agricultural plantations and illegal loggers has led to a surge in violence. The most recent murder was of Antônio Isídio Pereira da Silva, the leader of a small farming community in the Amazonian Maranhão state. Isídio suffered years of assassination attempts and death threats for defending his land from illegal loggers and other land grabbers. Despite appeals, he never received protection and police have never investigated his murder. Indigenous communities, who depend on the forests for their livelihood, particularly bear the brunt of the violence. Almost 40 percent of environmental activists killed were from indigenous groups. Eusebio Ka’apor, member of the Ka’apor indigenous tribe living in Maranhão state, was shot and killed by two hooded men on a motorbike. He led patrols to monitor and shutdown illegal logging on the Ka’apor ancestral lands. “We don’t know what to do, because we have no protection. The state does nothing,” the leader said. Thousands of illegal logging camps have been set up across the Amazon to cut down valuable timber such as mahogany, ebony and teak. It is estimated that 80 percent of timber from Brazil is illegal and accounts for 25 percent of illegal wood on global markets, most of which is sold to buyers in the United States, United Kingdom and China. “The murders that are going unpunished in remote mining villages or deep within rainforests are fuelled by the choices consumers are making on the other side of the world,” Kyte stated. Kyte also pointed to a “growing collusion” between corporate and state interests and high levels of corruption as reasons for the attacks on environmental defenders. This is reflected through the ongoing corruption case involving the Belo Monte hydroelectric dam which continued despite concerns over the project’s environmental and community impact and was used to generate over $40 million for political parties. Even in the face of a public scandal, Kyte noted that environmental legislation has continued to weaken in the country. The new interim Brazilian government, led by former Vice President Michel Temer, has proposed an amendment that would diminish its environmental licensing process for infrastructure and development mega-projects in order to revive Brazil’s faltering economy. Currently, Brazil has a three-phase procedure where at each step, a project can be halted due to environmental concerns. Known as PEC 65, the amendment proposes that industries only submit a preliminary environmental impact statement. Once that requirement is met, projects cannot be delayed or cancelled for environmental reasons. The weakening of key human rights institutions also poses a threat to the environment and its defenders. The Inter-American Commission on Human Rights (IACHR), whose goal is to address and investigate human rights issues in Latin America, is currently facing a severe funding deficit that could lead to the loss of 40 percent of its personnel by the end of July, impacting the ability to continue its work. It has already suspended its country visits and may be forced to halt its investigations. Many countries in Latin America have halted financial support to the commission due to disputes over investigations and findings. In 2011, IACHR requested that Brazil “immediately suspend the licensing” for the Belo Monte project in order to consult with and protect indigenous groups. In response, the Brazilian government broke off ties with IACHR by withdrawing its funding and recalling its ambassador to the Organisation of American States (OAS), which implements IACHR. “It’s a huge crisis,” Kyte told IPS. In its report, Global Witness urged Brazil and other Latin American governments to protect environmental activists, investigate crimes against activists, expose corporate and political interests that lie behind the persecution of land defenders, and formally recognize land and indigenous rights. Kyte particularly highlighted the need for international investigations to expose the killings of environmental activists and those responsible for them. He pointed to the murder of Berta Cáceres, an environmental and indigenous leader in Honduras, which gained international attention and outrage. “It’s a positive step that because of international outrage, the Honduran government was compelled to arrest these killers,” he said. “If we can push for an international investigation into her death, which I think is the only way that the real criminal masterminds behind her death will be held to account, then that could act as an example for future cases,” Kyte concluded. In March, Cáceres, who campaigned against the Agua Zarca hydroelectric dam, was shot in her home by two armed men from the Honduras’ military. A whistleblower alleges that Cáceres was on a hit list given to U.S.-trained units of the Honduran military.